Great Britain's Jodie Stimpson fends off the challenge of compatriot Helen Jenkins to lead a British one-two at the ITU Triathlon World Series in Cape Town. Stimpson, who won in the opening round of the series in Auckland, crossed the line in 1:46.11, seven seconds ahead of Jenkins. 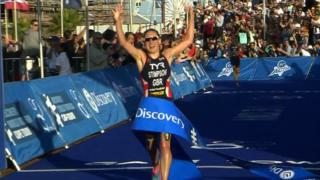 The USA's Gwen Jorgensen produced a stunning run to finish third.